The many environmental, economic, and technological challenges facing local governments in recent years have led to the evolution of smart cities across the globe. By leveraging information and communications technology through municipal public and private partnerships, cities large and small are now relying on these collective resources more than ever. Here are some Mobility as a Service technologies. Steadily increasing traffic congestion, poor air quality, inefficient and overwhelmed public transit systems are just a few of the highly complex problems that waste taxpayers’ dollars and diminish their quality of life. The lack of available real estate to expand existing transit systems and other government-funded services is another obstacle that severely limits local governments’ abilities to create prompt and viable solutions. As a result, urban planners, ecologists, and engineers are combining their inventive efforts towards innovations in Mobility as a Service (MaaS) technologies, some of which seem almost too futuristic to be true. In March 2018, British IoT and mobile transit app developer UrbanThings unveiled its Hex Tag technology at a transportation conference in Berlin. The Hex Tag is an innovative combination of QR, NFC, and Bluetooth capabilities that saves private transport companies, public transit systems, and even individual riders both time and money. Users can pay for fares by merely touching the QR code located on their smartphone to one displayed on the bus, train, e-taxi, rental bike, or autonomous vehicle they are using. This new form of Mobility as a Service essentially makes those bulky, expensive ticketing machines obsolete, which may be one reason CEO Carl Partridge is naming the Hex Tag “Ticketless” technology. Without the need for ticketing machines, the future of smaller, on-demand transport systems like driverless taxis becomes significantly brighter. Furthermore, the Hex Tag tracks all traveler interactions with each transport system, including when the traveler enters and exits a vehicle and the length of the journey compared to other transport options. Its innovative Be-In/Be-Out ticketing feature ensures passengers pay the best possible prices, too. Thanks to Hex Tag technology, citizens can design their own transport systems to meet specific and unique demands. Self-driving cars might not become the norm until the next decade, but the self-driving bus could appear on the scene much sooner. In fact, the District of Columbia is already conducting an experimental trial of an electric shuttle dubbed the Ollie Bus (pictured above). Similar trials are also occurring in Switzerland and Germany. Utilising a combination of artificial intelligence and smartphone applications, this driverless bus was initially designed to make public transportation more user-friendly for travellers with hearing, visual, and physical disabilities. Riders can “converse” with the bus via IBM’s AI-powered Watson technology, asking the bus which route it is taking or which seat is available. Users can also pay their fares digitally using hex tag or other smart technologies. In the meantime, the bus only travels about 35 miles per hour, and special sensors located on the front of the vehicle prevent potential collisions. In the future, the Ollie Bus may even be augmented with machine vision technology to facilitate conversations between the bus and hearing-impaired travellers through sign language. In 2017, the smart city of Austin, Texas, adopted a proposed pilot program which allows personal delivery devices or PDDs to be deployed on its city sidewalks. PDDs are most useful for the delivery of food and other retail items. The current maximum allowable weight is a whopping 300 pounds. 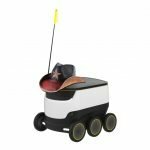 Think of PDDs as an extension of Amazon’s new “PrimeNow” delivery services, but the packages are being delivered by a robot rather than a human. Retailers save money by hiring and training fewer employees, and customers benefit from a more extensive selection of businesses offering timely and affordable delivery services. In addition to Austin, several other municipalities are currently implementing new regulations regarding PDDs, including San Francisco and Washington, DC. Meanwhile, the states of Florida, Virginia, Wisconsin, and Idaho are considering statewide regulations. As city managers and elected officials grow increasingly concerned with environmental issues and global warming, carbon-powered vehicles are on the way out. However, electricity-powered cars and buses are not the only available option. Cities like Berlin, Germany, are constructing smart grids utilising solar, wind, and other renewable energies like farm waste, as well. Siemens is conducting a trial on its eHighway system which combines environmentally-friendly rail technology with the flexibility of big rig, diesel-powered trucking. By providing a system of powering lorries via overhead wires, the attached vehicles can theoretically travel for extended periods while self-charging. Another similar system in the works involves public buses powered by special charging coils located in the road itself. As the future of Mobility as a Service technology continues to advance and expand, there will be many new players jockeying for position within the consumer marketplace. Mobile phone companies, public sector transit systems, private transportation companies like Uber, automobile manufacturers, and Internet giants like Amazon and Google are each looking to corner the market in their respective areas of expertise. Smart cities today are always on the lookout for new and exciting Mobility as a Service technologies that are easily adaptable to this constantly evolving world of unlimited and as-yet unimaginable possibilities.